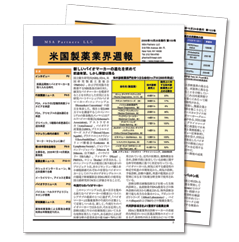 Beikoku Seiyaku Gyokai Shuho is a weekly report covering regulatory and industry developments in the U.S. pharmaceutical market published in Japanese by MSA Partners. Corporate subscribers to the publication include all of Japan’s largest pharmaceutical and other life sciences companies. Each week’s issue includes a feature article, usually followed by an interview article on the same topic. Recent features have covered a range of issues, from healthcare reform initiatives to new oncology treatments. Interviews are held with pharmaceutical and biotech executives, government officials, medical and legal experts. For a list of recent interview articles, please click here. Each week’s issue also includes coverage of the important news developments of the week divided into regulatory news, company news, biotech news, and research news. Designed to enable executives based in the U.S. or Japan to easily keep abreast of important industry trends and news developments in the U.S. market, the Shuho has quickly established itself as a standard information resource in Japanese on the U.S. pharmaceutical industry.